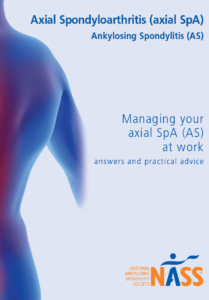 This is a practical guide to working when you have axial SpA (AS). It includes information on your rights at work including the Equality Act and reasonable adjustments. The guide also gives advice to help decide whether it’s best for you to let your employer and colleagues know about your axial SpA (AS). It gives practical tips on staying well at work including workstation assessments and taking time out to stretch. Fatigue can be a major issue so we cover pacing and prioritising. There is a list of useful contacts in the back, along with some suggestions about accessing extra help and support.